The green turtle (Chelonia mydas) is an amazing creature that is vital to the health of marine ecosystems, and currently listed under the Endangered Species Act. Many good people are working hard to protect these graceful amphibians, including the World Wildlife Fund. Our seas are teeming with life and I am grateful for those who continue to protect our wild oceans and these denizens of the deep. 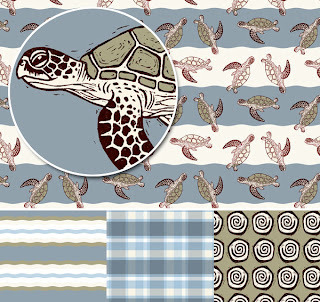 Turtle and spiral designs are from original hand-carved linocuts. 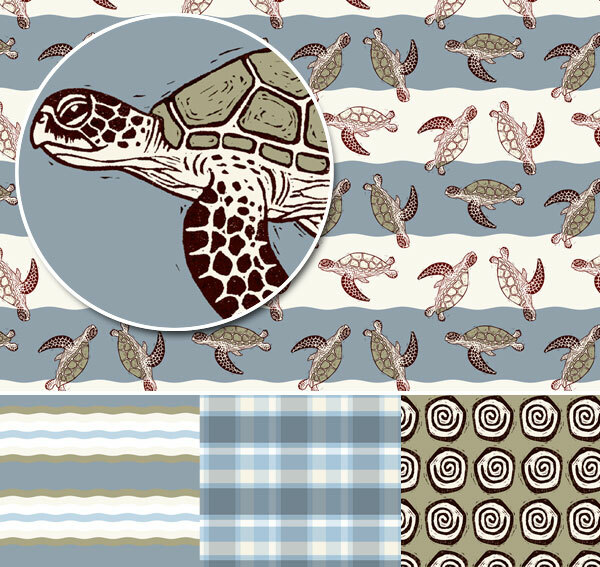 Note that the three coordinating patterns are shown larger in scale than the turtle pattern. One more of your nicely executed story Kim! Good work! Keep it up!